Additionally, according to the email dump, Clinton chatted with former U.K. Prime Minister Tony Blair about classified foreign policy matters before she was sworn in, aided the application of at least one State Department applicant who was connected to her daughter, Chelsea, and apparently met with Putin-aligned Georgian oligarch Bidzina Ivanishvili before he became prime minister on a staunchly pro-Russian platform — and with reported help from a Russian interference operation. Ivanishvili pointedly did not criticize Putin during his campaign, despite Putin’s invasion of Georgia years earlier — and in 2012, Ivanishvili made headlines for refusing to meet with Clinton unless it was a one-on-one sitdown. Clinton’s discussions with Blair included a classified 2011 conversation on foreign policy, and another classified, redacted 2011 conversation concerning a “speech.” Clinton also apparently discussed job-related topics with Blair on January 16, 2009 — while George W. Bush was still president but after the Senate Foreign Relations Committee had approved her for the job. 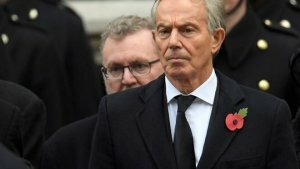 In one email thread with the subject line “Re: Gaza,” dated January 16, 2009, Blair said he wanted to have a matter “resolved before Tuesday,” apparently referring to Obama’s inauguration.